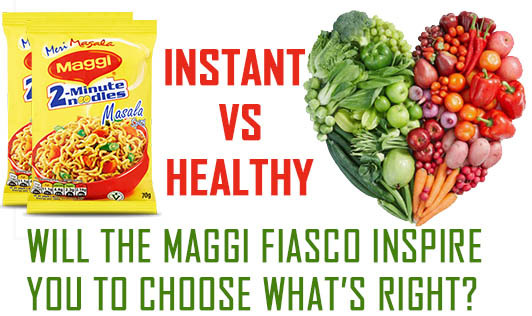 Instant vs. healthy: Will the Maggi fiasco inspire you to choose what's right? The entire ruckus surrounding Maggi containing lead and MSG has opened avenues for serious probe into the kind of food we consume. Brands making tall claims about using ‘healthy’ ingredients have lost their impact on consumers. And nutrition experts are now voicing their concern more clearly. They are sharing their views more openly on the real nutritional value of food items we use on a regular basis. Brown bread does not mean fibrous always. If the sugar content is higher than other breads, it definitely is a caramel-coated variety of the white bread. So, watch out for the sugar content before buying ‘brown bread’. Antioxidant preservatives are found to be rich in butyl hydroxytoluene. While this preservative is used to increase the shelf-life of a product, it is certainly stripping the consumers’ of good health. Potato chips, certain confectionaries, and refined grains are actually subjecting the consumer to more health complications. Ice-creams, biscuits, breads, and certain cheeses are rich in emulsifiers that actually hit your intestines hard and cause indigestion problems. The list is endless. From refined grains to snacks, there is hardly any completely ‘organic’ component on our monthly grocery list. Certainly, the real culprit is our fast-paced lifestyle because of which instant foods have become more of a necessity now. Everybody is drawn towards foods with higher shelf-life, because who wants to go grocery shopping often? Also, time constraints and busy work schedules have pushed us to choose convenience over healthy eating. No wonder a majority of our nation struggles with obesity, indigestion, heart issues, and diabetes. There are however, more serious (than the much dreaded lead and MSG), yet silent trouble makers such as sugar, sodium, and calories. If we plan on staying healthy, we need to kick these food items, too, out of our life, especially processed and canned foods, burgers, and frozen foods. In fact, consumption of any food loaded with calories and fats needs to be reduced. It is high time everybody should rethink about the food choices they make. The Maggi episode is certainly an eye-opener.